Mother’s Day can prove to be challenging for anyone who is mourning the loss of their mother, even long after she passed. It can also be difficult to find meaningful ways to honor your mother and her life on Mother’s Day. Even though your mother is no longer here, you can still celebrate and remember her in ways that reflect the life that was unique to her. 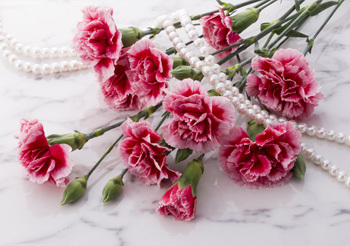 White carnations are traditionally the flowers chosen to remember mothers who are no longer with us. Pick up a bouquet and leave it at her gravesite or scatter them where her cremains are. If she had another favorite flower she loved, buy those instead. If you’re looking to create a quiet reminder, place a vase of flowers next to a picture or lit candle. If there was a special meal or favorite “comfort food” your mother cooked that you remember, honor her memory by cooking that dish. Invite your family and friends over and make an event out of it by sharing some of your happiest mealtime memories. Make a donation in her memory to a cause that was dear to your mother’s heart. You may want to consider volunteering a few hours of your time to benefit others. It’s even as simple as buying a strangers meal at your mother’s favorite restaurant or buying coffee for the person behind you. If your mother had another favorite way of showing kindness to others, perform that act on behalf of her. Or if there is a favorite memory you had with your mom of helping others, partake in that event in memory of her. If your mother loved to garden, then honor her memory by planting a garden of your own. Doesn’t need to be anything extreme, it could simply be a potted flower on a windowsill. Involve your family by planting one together and reminiscing on the memories you had with her. Was your mother one to enjoy adventure or maybe she had a favorite vacation spot? Whether it was near or far, gather your family and plan a trip as a tribute to your mother. Share the memories you have there as well as create new ones. It is never easy coping with the death of a loved one especially on days such as Mother’s Day. Celebrating your mother’s life this Mother’s Day may bring comfort through reminiscing with family and friends. There are countless ways to honor a lost mother; the important point is to embrace her spirit and keep her memory alive.